What a week! In case you were thinking about getting malware on your site, let me firmly state that it ain’t no fun to deal with. You should take up swimming in a meaty wet suit in shark-infested waters instead. My husband is extremely computer savvy, and even he was having problems with it. I have now paid someone, a company called Sucuri.com, to take care of it from now on. It only took them four hours to remove the malware and get me off of Google’s naughty list. As a result, all the posts I had lined up for the week have been seriously delayed. And, since I am a last-minute shopper this year, we have spent & will spend all weekend shopping, decorating, cleaning and baking. Top Ten Books I Read in 2012. The meme by the Broke and the Bookish tackles which books I read this year that I liked best. Be prepared for cheating (as always). To celebrate finally coming back from the dead, I posted Hallelujah! I am Malware Free: God Bless Sucuri.com. And since I didn’t post much this week, I included a little eye candy to keep (mostly me) you entertained for the time being. The winner of the Angel Lawson book giveaway was announced: congratulations to Melissa for winning the raffle for Shadow Bound! I finished watching the second season of True Blood. In a cruel twist, the third season is currently waiting for me at the library…that’s closed until the 26th. So what am I supposed to watch while I am locked behind closed doors wielding wrapping paper, scissors and curly ribbon? I completed reading The Candidates by Inara Scott. A review will be posted this week. Hopefully it’s not creepy, but occasionally, when I am at the book store, I will ask people shopping in the Young Adult section what they are reading and what books they have read that they liked. One girl told me about the House of Night Series by P.C. Cast and Kristin Cast, so this past week I read the first one called Marked. I will write a review next week. The last book I finished this week drowned me in a sea of awesomeness. By Maggie Stiefvater, it is called The Raven Boys. Next week I will do all I can to try to squeeze a review out of my brain. My daughter, @OhweewahFilmz, read In a Glass Grimmly by Adam Gidwitz and wrote a review that I will post this coming week. Hot dog – I am a wiener! 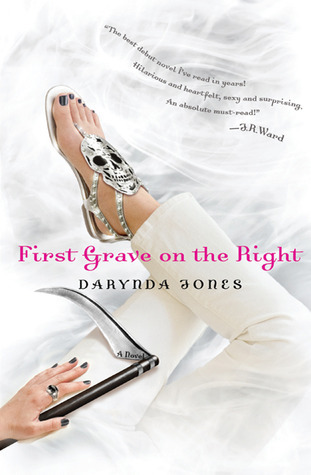 I was informed that I am a WINNER in the Darynda Jones First Grave on the Right sweepstakes. I love this series (and have reviewed some of the series here on this very blog), so I am super excited. They sent me a paperback copy of the book. I found first edition hardback copies of Ally Carter’s I’d Tell You I Love You, But Then I’d Have to Kill You and Don’t Judge a Girl By Her Cover at the library. They sell books that people bring to them, and each of these beauties cost only $2.00 a piece! I got a lot accomplished with my cataloging project re. my home library. We have a lot of books in our family, so I have been using Readerware software to log them. I think I am finished with fiction, but we still have a looooong way to go. Hope everyone has a great week, and if you are a celebrator/celebratrix of Christmas, I hope yours is a super happy one! You forgot to link up cupcake, congrats on the Jones win! Woot! woot! I set it to post after midnight…and I’ve been distracted by cleaning, etc. (blech). 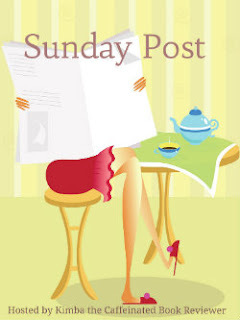 I just linked up – thanks for the reminder! Have a great holiday and week! I still have to read First Grave on the Right. Congrats on the win. It is easy to fall short of our posting goals this time of year. I have been spending more time reading lately, so between that and Christmas prepping, I have a lot of reviews to catch up on. Congrats on winning First Grave on the Right… You got a great deal at the library too. Enjoy.